I must admit that only a few weeks into the new year, and I’ve already broken some of my resolutions. Mainly the one with trying to eat more pork. This past week I visited a place that has been on the back of my mind ever since they went under renovations last year: Kansas City BBQ Company of North Hollywood. Now I know you may be skeptical. How could any place in North Hollywood create BBQ as good as the city it’s named after, which itself is a bastion of delicious BBQ? Well, bear with me for a moment here, because you may be surprised. 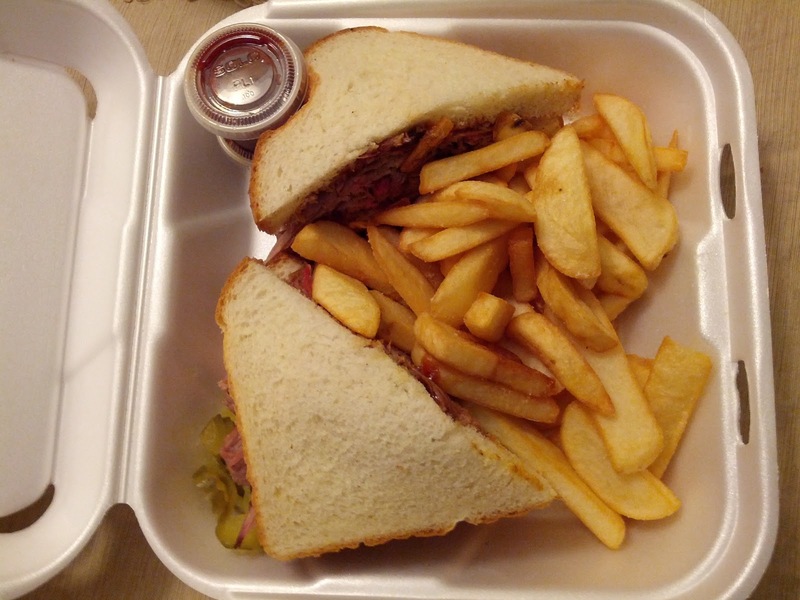 When I arrived at Kansas City BBQ, I had planned to order the sliced pork sandwich and it was on the tip of my tongue when I was asked for my order, but at the last moment I ordered the sliced beef brisket sandwich (hey it’s listed as one of their most popular items!). The sandwich is impressive in size. 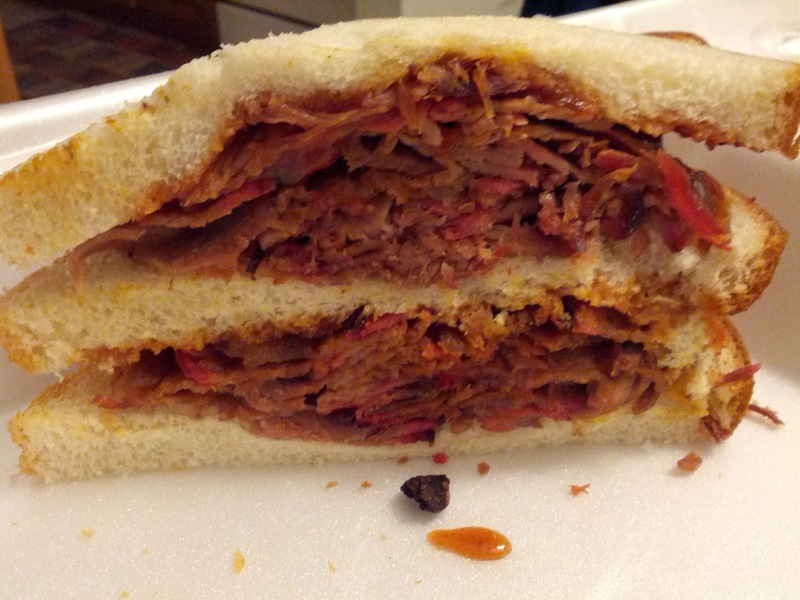 A double-decker sandwich with three slices of standard white bread, the sliced brisket was delicious. Cooked in their barbecue sauce for twenty (yes TWENTY) hours prior, this thinly sliced meat falls apart in your mouth with each bite. The brisket is full of smoky (from hickory wood) and spiced flavors (a secret combination of in-house spices) that just permeate your being. The white bread isn’t even a factor in this sandwich really. It holds together, but its true function is just to serve as a vehicle for the brisket to be eaten. So does it live up to the standard of true Kansas City barbecue? Well, I’m sure that if you sat down to a traditional barbecue place in that area, you’d find some pretty amazing restaurants, but honestly The Kansas City BBQ Company does an amazing job at creating delicious barbecue sandwiches far away from the area generally associated with the style of food. For sides, definitely get some of the baked beans (full of smoky flavor and shredded beef) as well as the potato salad (a mildly spicy mustard based style). You won’t be disappointed. So Readers, I’ll be wrapping up for a bit here in Los Angeles, as I will be back east next week and sandwiching in Philadelphia, New York and possibly DC. I have some ideas picked out, but if you have any suggestions, I would gladly take them. That looks so good. As usual! One day, this blog shall bring you back to the dark/delicious side. one day. If, while you are back east, you happen to be passing through Princeton, NJ, I highly recommend Hoagie Haven (http://www.hoagiehaven.com). They are known for their cheesesteak and chicken parm, but I like their simple ham sandwich…which I believe is #11.
awesome. thanks for the heads up!